I found this barn while travelling the back roads of the county in which I live. 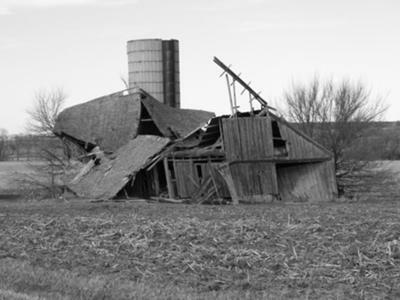 Looking at the photo, I wonder - what has this barn seen in its lifespan? The lean years and full years, the worries of the farmer over his crops and the machinery that had to be fixed to get the harvest in on time. This is a great spot for a black and white photo - and a nice story to go with the photo too! If I could make a recommendation; increase the contrast a little if possible. The photo looks a little washed out. A small tweak on the contrast setting in your image editor should do the trick. If you're feeling brave, and have Photoshop available to you, give the channel mixer a try. There's a tutorial here on how to make a top quality black and white picture.